I'm a watch collector. 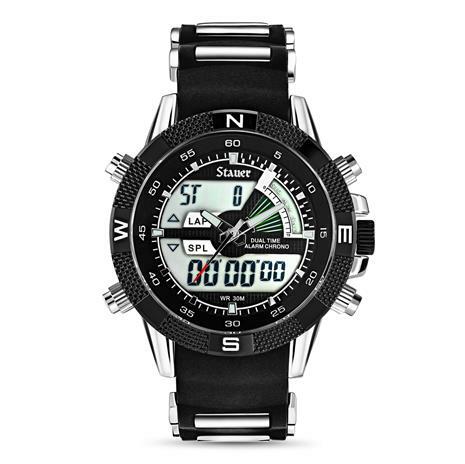 I purchased the citizen PROMASTER Aqualand Depth in July for $570.00. Last week I received my Stauer sports watch for $63.00 with shipping. Stauer is much cheaper but it can compete with any of my other Durable sport watches. It's amazing! The detail and craftsmanship is 1st class. The watch is much bigger than it looks and should be priced much higher. I have two Stauer watches and will continue to purchase more! Thank you Stauer for the Steal! At this price buy a few for gifts...Great looking and full of features. I love the look and the night light as well as the dynamic green moving display. Much nicer than the price would indicate. My First Stauer. Plan to buy more, Great Quality,and Design. Too many features for and Old School watch Guy. Love it!! I love watches. I have owned quite a few "high dollar" watches over the years (BlancPain, Jaeger LeCoutre, Rolex, Omega, etc.). I have been a regular customer for almost a year now and have purchased a number of items all of which have been high quality and very reasonably priced for the quality received. This watch, due to the silicone watch band, is by far the most comfortable watch I have ever worn. It keeps time very accurately and is the perfect size for me. I wear this all the time although I do try to rotate among my various Stauer watches...all good looking, very accurate time pieces. Thanks and keep up the good work! You will not regret buying this watch! I bought other watches that were more money and this one is just as good at a cheaper price. Time will tell if it lasts. So far so good. Time to kick overpriced sports watches to the curb. We've got your game changer right here. According to CNN Style, the sports watch was one of ten watches that changed timekeeping history. Invented by a frustrated watch engineer named Kikuo Ibe, who was compelled to design an indestructible watch after his favorite watch broke. What followed was a marketplace awash in sports watches, many outrageously overpriced. Pardon us while we step in and break through the clutter. We've got your game changer right here, with a price that's just as revolutionary! No, we did not leave off a zero. Introducing the Stauer Sports Hybrid ” a watch that's mastered durability, functionality AND style. A shockproof fusion of stainless steel and silicone, this watch is as durable (and comfortable) as they come. Not to mention, just downright good looking. This fully-loaded timepiece does everything a precision instrument should do, and more. It combines both analog and digital timekeeping. The analog mechanism counts the hour, minute, and second while the digital display functions as a stopwatch, and lists the day, date and month. Let's just say you've got time covered. We're game changers too. With over a million watches sold, we know a thing or two about the watch industry. We have the engineers and the expertise to build a top-notch precision timepiece for far less than our competitors. We know. We've been keeping score. Your satisfaction is 100% guaranteed. Wear the Stauer Sport Hybrid Watch for 60 days. If you're not convinced you got excellence for less, send it back for a refund of the item sale price. Your satisfaction is our top priority. That's a promise that won't break. Timing is everything. Offering a top performing sports watch at this price is going to deplete our inventory pretty quickly. Order today, so you can think to yourself, "well played."